Jonathan Apple (Malus pumila) produces an apple with a colorful bright red skin. Jonathan Apple is a heavy bearing tree with fruit ripening in late August through early September in Los Lunas, New Mexico. Flesh is crisp, white, sweet and juicy, with a pleasant tartness. Jonathan Apples are good for fresh eating and cooking and will keep in cool storage for several months. Jonathan Apples are self-fruitful and hardy to USDA zone 4. 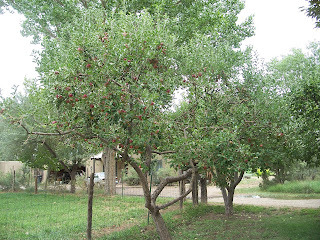 Apple trees need regular water for good fruit production and growth. Trees That Please Nursery has Jonathan Apples available on M111 rootstock. M111 rootstock is a very vigorous semi-dwarf rootstock but trees can be kept to any desired height with summer pruning. Apple trees grown on M111 rootstock grow well on either clay or sandy soils.